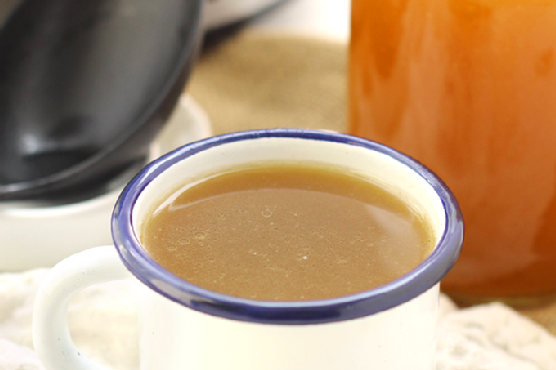 How To Make Bone Broth In Your Slow Cooker might be just the side dish you are searching for. For 7 cents per serving, this recipe covers 2% of your daily requirements of vitamins and minerals. Watching your figure? This caveman, gluten free, primal, and whole 30 recipe has 9 calories, 0g of protein, and 0g of fat per serving. Only a few people made this recipe, and 6 would say it hit the spot. A mixture of water, salt and pepper, onion, and a handful of other ingredients are all it takes to make this recipe so delicious. From preparation to the plate, this recipe takes around 24 hours. All things considered, we decided this recipe deserves a spoonacular score of 15%. This score is rather bad. Try Slow Cooker Bone Broth, How to make Chicken Broth in your Slow Cooker, and How to Make Beef Broth in a Slow Cooker for similar recipes. Carrots can be stored in the fridge for 2 to 3 weeks. The starch in the carrots will turn to sugar over time, but this is not a problem, they'll just taste sweeter. The academy lesson about carrots contains more useful information.